81 The difference between exhaust pressures. 102 Pressure supercharging charge air pipe after intercooler (intercooler). 105 Combustion air temperature before entering the cylinders (after AGR). 173 exhaust gas temperature before further purification. 651 Bank1, the injector 1 (four-cylinder engine cylinder №1; six engine cylinder №1; eight-cylinder engine main №1, №5 slave cylinder; ten-cylinder engine main №1, №6 slave cylinder; twelve-cylinder engine №1 main cylinder № 12 slave). 652 Bank2 injector 1 (four-cylinder engine cylinder №3; six engine cylinder №5; №2 eight-cylinder engine cylinder head, the cylinder №7 slave; №5 ten-cylinder engine cylinder head, the cylinder №10 slave; twelve-cylinder engine №5 main cylinder № 8 slave). 653 Bank1, injector 2 (four-cylinder engine cylinder №4; six engine cylinder №3; eight-cylinder engine main №3, №6 slave cylinder; №2 ten-cylinder engine cylinder head, the cylinder №7 slave; twelve-cylinder engine №3 main cylinder № 10 slave). 654 Bank2, injector 2 (four-cylinder engine cylinder №2; №6 cylinder six-cylinder engine, eight-cylinder engine main №4, №8 slave cylinder; №3 ten-cylinder engine cylinder head, the cylinder №8 slave; twelve-cylinder engine №6 main cylinder № 7 slave). 655 Bank1, an injector 3 (six engine cylinder №4; №4 ten-cylinder engine cylinder head, the cylinder №9 slave; twelve-cylinder engine №2 main cylinder №11 slave). 959 Time and date (incorrect value seconds). 960 Time and date (incorrect value minutes). 961 Time and date (incorrect value hours). 962 Time and date (incorrect value days). 963 Time and date (month incorrect value). 964 Time and date (s wrong value). 1079 a pressure sensor supply line. 1080 fuel pressure sensor supply low pressure circuit, the boost pressure sensor, oil pressure sensor, and exhaust pressure sensor. 1131 The temperature of the charge air boost in the tube after the intermediate cooler (intercooler). 2039 FFR1 (driving motor unit or computer). 3009 Too high engine speed. 3014 Main relay (inside the control unit). 3016 FFR1: Invalid message due to engine brake. 3017 FFR1: Wrong message on a given moment. 3018 FFR1: Invalid message for limit controller. 3020 FFR1: Invalid message due EDR (the maximum speed limiter). 3022 FFR1: Setting ZDR (intermediate speed regulation). 3023 FFR1: Invalid request message “MEOS” (an instant increase in engine speed). 3024 FFR1: Invalid request message off of a linear function. 3025 FFR1: Checking the number of reserved memory. 3029 FFR2: Wrong message, the installation of idling. 3030 FFR2: Invalid message for limit controller. 3031 FFR2: Setting too high LLR. 3032 FFR2: Invalid request message idling. 3033 FFR2: Error messages start request. 3034 FFR2: Error message engine stop request. 3035 FFR2: Checking the number of reserved memory. 3038 FFR3: Error in the notice of the parking lot. 3039 FFR3: Checking the number of reserved memory. 3046 The atmospheric pressure sensor ..
3063 Inertia phase has not been completed. 3076 Wrong Number (ID) FFR unit. 3077 No number (ID) FFR unit. 3082 The accuracy of the oil pressure sensor readings. 3083 The accuracy of the pressure sensor in the fuel line. 3085 Wrong message “Vehicle distance”. 3086 AGR actuating device, the end position. 3088 charge air boost pressure sensor pipe after intercooler (intercooler). 3089 Temperature sensor combustion air before entering the cylinder (after AGR). 3099 The pressure sensor in the pipeline. 3100 The fuel pressure sensor (low-pressure circuit). 3674 FFR1: Disabling memory unit 8 bytes / bits 5-8. 3676 Incorrect excessive tripping mechanism (After run test). 3678 Voltage capacitor unit 1. 3679 Voltage capacitor unit 2. 3687 The pressure relief valve. 3737 Master / Slave Work. 3738 The unevenness of the cylinder. 3739 The unevenness of the cylinder. 3773 Master / Slave mode. 3781 The pressure relief valve. 3783 FFR2: Errors in the reports of the specified acceleration noise control unit (NORD). 3784 A mistake by the Smoke-ID message. 3785 Dust filter PM-Kat (solids catalyst). 3786 The temperature of the particle filter. 3787 Recovery of the dust filter. 3789 Comparative differential sensor or exhaust gas pressure sensor. 3790 The accuracy of exhaust pressure difference. 3792 Sensor additional purification of exhaust gases before temperature. 3793 exhaust gas temperature sensor after a post-treatment (physical parameters). 3795 The throttle valve AGR. 3796 The output stage (Highside) EGR 2. 3797 The output stage (Highside) the amount of oxygen in the exhaust gas sensor (lambda probe). 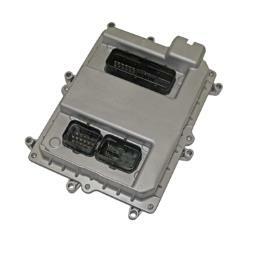 3798 Output stage OBD lamp. 3800 The output stage (Highside) a bypass valve for exhaust gas turbocharger. 3801 The output stage (Highside) NT circuit cutoff valve. 3802 The output stage (Highside) off the compressed air valve. 3803 Error in sending messages CAN1 (FFR / EDC-CAN). 3804 Error in sending messages CAN1 (FFR / EDC-CAN). 3805 Error in sending messages on CAN2 (Master-Slave CAN). 3806 Error CAN2 (Master-Slave CAN). 3807 Error sending FFR1 (FFR / EDC-CAN). 3809 Error sending FFR3 (FFR / EDC-CAN). 3810 Error time and date (FFR / EDC-CAN). 3811 Identification of additional purification of exhaust gases before temperature. 3812 Identification of the exhaust temperature after the post-treatment. 3814 Duration off control units. 3819 CAN3 (CAN exhaust gas treatment systems). 3820 Checking CAN1 (oil temperature and the ambient air). 3821 Checking CAN3 (CAN exhaust gas treatment systems). 3822 Break (timeout) in sending messages CAN3 (CAN exhaust gas treatment systems). 3836 Determination of the amount of oxygen sensor values ​​in the exhaust gases (a lambda probe). 3837 Controlling the amount of oxygen sensor values ​​in the exhaust gas (lambda probe). 3838 The internal resistance of the amount of oxygen sensor in the exhaust gases (a lambda probe). 3839 The internal resistance of the amount of oxygen sensor in the exhaust gases (a lambda probe). 3844 The temperature of the charge air before entering the cylinder. 3847 The temperature of the charge air boost in the tube after the intermediate cooler (intercooler). 3850 Regulation of a closed system of exhaust gas recirculation. 3854 a block temperature sensor EDC №2. 3855 Supply amount of oxygen in the exhaust gases (a lambda probe). 3856 The calibration sensor value the amount of oxygen in the exhaust gases (a lambda probe). 3857 Communication SPI amount of oxygen in the exhaust gas sensor (lambda probe). 3858 Low amounts of oxygen sensor in the exhaust gas (lambda probe). 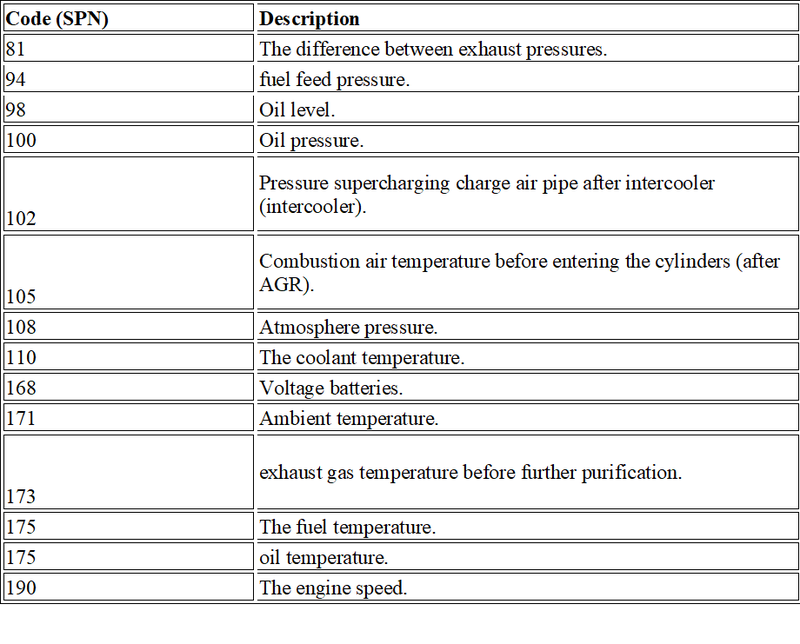 3859 Calibration value for the amount of oxygen sensor temperature of the exhaust gas (lambda probe). 3868 Identification temperature after the charge air intercooler (intercooler). 3871 Identification temperature within EDC unit. 3872 2 Identification temperature within EDC unit. 3874 volume correction factor is too large segment 0. 3875 volume correction factor is too large segment 1. 3876 volume correction factor is too large segment 2. 3877 volume correction factor is too large segment 3. 3878 volume correction factor is too large segment 4. 3879 volume correction factor is too large segment 5. 3880 The output stage 12 for a LIN bus B. 3925 The coolant temperature sensor 2. 3926 The control pressure in line gradient sensor (RDS). 3927 Supply amount of oxygen in the exhaust gases (a lambda probe). C Control AGR oxygen sensor in the exhaust gas (lambda probe). Error MIL (light Fault indication). 3930 C Control AGR oxygen sensor in the exhaust gas (Oxygen sensor). Error PR (power reduction). 3931 The output stage (Lowside) inlet air flap. 3932 The output stage (Lowside) the charge air pressure control ..
3936 Too high pressure charge air. 3938 No adaptation of the amount of oxygen in the exhaust gas sensor (lambda probe). 3942 The pressure of the charge air intercooler after a low pressure. 3943 Pressure sensor charge air intercooler after a low pressure. 3944 The temperature of the charge air intercooler after a low pressure. 3945 Combustion air temperature sensor after the low-pressure intercooler. 3946 A cooler discharge high-pressure air. 3947 A cooler discharge low-pressure air. 3963 Error LIN (Local Area Network). 3964 transmission gap of LIN messages. 3965 Error LIN (Local Area Network). 3966 Self oil level sensor. 3972 Control of the low NOx values. 3973 The pressure of the charge air in the high pressure circuit. 3974 The pressure of the charge air in the low pressure circuit. 3975 The gap sensor wires. 3976 Control fault status of the amount of oxygen in the exhaust gas sensor (lambda probe). 3978 Electrical failure the amount of oxygen in the exhaust gas sensor (lambda probe). 3979 Supply amount of oxygen in the exhaust gases (a lambda probe).